This French classic tuiles recipe appears as the technical challenge in the Biscuits & Traybakes episode of Season 2 of The Great British Baking Show. To make the chocolate mousse, break the chocolate into small pieces and set aside. In a small saucepan, heat half of the cream until just simmering. Remove from the heat, add the chocolate pieces and stir until the chocolate has melted and the mixture is smooth. Pour the mixture into a bowl and leave to cool for 15 minutes. Add the remaining cream and using a hand-held electric whisk, beat the mixture until soft peaks form when the whisk is removed. In a clean bowl, whisk the egg white until stiff peaks form when the whisk is removed. Add the sugar, a tablespoon at a time, and continue whisking to make a soft meringue mixture. Carefully fold the meringue through the chocolate mixture. Put the mousse in the fridge and leave until set. To make the tuiles mixture, use a hand-held electric mixer to mix the butter, sugar and vanilla extract into a paste. Gradually add the egg whites, whisking all the time. Fold in the flour a little at a time beating with a wooden spoon between each addition. Transfer one-sixth of the mixture into a small bowl and add the cocoa. Beat until well mixed. You now have two bowls of tuile paste, one plain and one chocolate. Cover both bowls with cling film and leave to rest for 30 minutes. To bake the tuiles, preheat the oven to 180C/350F/Gas 4. Line a baking tray with parchment or a silicone sheet and place the tuile template in position. Spread some of the plain tuile paste over the cut out shapes of the template using a palette knife. Draw the blade across the template to remove any surplus paste. Remove the template by peeling away from the tray, leaving you with paste shapes on the baking tray. You should be able to make nine tuiles. Reserve the remaining plain tuile paste. Spoon the chocolate paste into a small piping bag fitted with a writing nozzle. 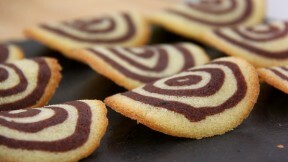 Pipe patterns (concentric circles, dots, straight lines, squiggles, wavy lines) onto the tuiles. Cook for 5-6 minutes, or until just turning golden-brown around the edge. Remove from the oven and, working very quickly, drape the tuiles over a rolling pin while still warm, so that they cool in a curved shape. If the cooked tuiles start to harden before you have chance to shape them all, return them to the oven for 30 seconds to one minute to soften. For the tuile cigars, make a further nine plain tuiles using the template as before. Bake for 5-6 minutes, or until pale golden-brown. Reserve the remaining plain paste. Remove from the oven and, working very quickly, bend the warm tuiles around wooden spoon handles to make cigar shapes. Dip the cigar tuiles in the melted plain chocolate. Leave aside to set. For the tuile basket, drop a spoonful of the remaining plain paste onto a silicone sheet and flatten with the back of a spoon to an uneven circle approximately 8cm/3¼in in diameter. Cook for 5-6 minutes, or until a pale golden-brown colour. Remove from the oven and lift off the baking tray. Mould immediately over a muffin cup or ramekin to make a basket shape. Leave them to cool. Use a tablespoon dipped in cold water to place scoops of the chocolate mousse into the basket. Serve with the cigar-shaped and curved tuiles. Equipment and preparation: You will need a template for shaping the tuiles mixture before baking. You can buy these, or try making one by cutting circular holes in a sheet of silicone or plastic.